With business deals worth $22 billion inked between Indian and Chinese business firms, Prime Minister Narendra Modi described the economic environment in India as an “historic opportunity” for the Chinese companies. 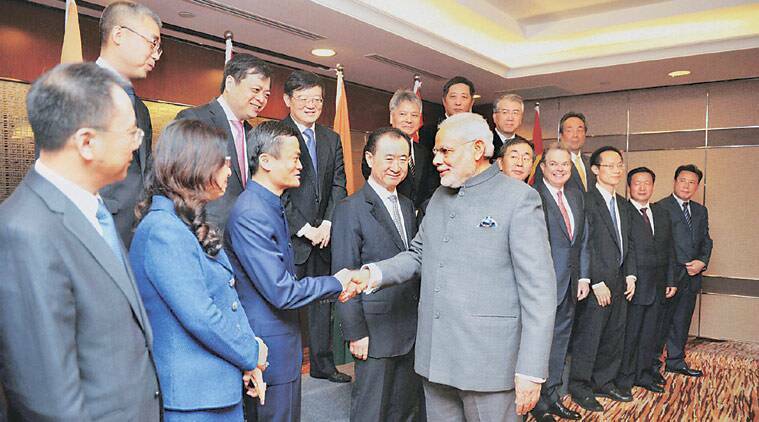 While Chinese top business honchos like Jack Ma of Alibaba gave a thumbs up to Modi’s ‘Make in India’ initiative, Infosys chief Vishal Sikka and senior executives from Adani group touched the Prime Minister’s feet. “Many Chinese companies have the possibility of investing in India to take advantage of India’s potentials. The potential lies in manufacturing, processing as well as in infrastructure. I am here to assure you that India’s economic environment has changed. Modi witnessed signing of 26 MoUs which span a wide range of industries including renewable energy, power infrastructure, and steel and small & medium industries. “As you have successfully done, we also want to promote manufacturing in a big way particularly to create jobs for our youth who form 65 per cent of our population,” he said. He stressed that his government’s initial measures have helped in building up an enhanced investor confidence. “The sentiments for private investment and inflow of foreign investment are positive. Foreign direct inflows have gone up by 39 per cent during April-2014 and February-2015 against the same period in previous year,” he said. “Our growth rate is above 7 per cent. Most of the international financial institutions including the World Bank, IMF, OECD and others are predicting even faster growth and even better in the coming years. Moody’s have recently upgraded the rating of India as positive on account of our concrete steps in various economic fields,” he said. As two major economies in Asia, he said that the “harmonious partnership” between India and China is essential for economic development and political stability of the continent. “You are the ‘factory of the world’. Whereas, we are the ‘Back office of the world’. You give thrust on production of hardware, while India focuses on software and services. “Similarly, Indian component manufacturers have been masters in high-quality precision and the Chinese players have mastered the art of mass production. “The component design expertise of Indian engineers and low cost mass production by China can cater to the global markets in a better way. This industrial partnership of China and India can bring about greater investment, employment and satisfaction of our people,” he told the Indian and Chinese company executives at the Ritz Carlton hotel. 3 Ra.Two: Will Rahul Gandhi be a flash in the Congress pan?